A horse is a horse, of course, of course. Unless, of course, it's an Unpleasant Horse by PopCap's edgier division, 4th & Battery. The premise of this free iOS game is simple. 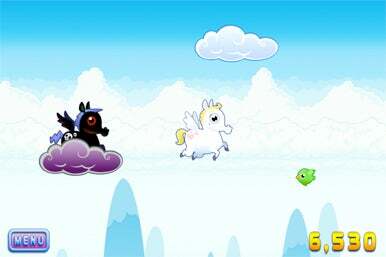 You're a cute little horse with wings--and a bad attitude--passing time by hopping from cloud to cloud. Occasionally a pretty bird will fly by. They have feathers which you need to help stay afloat when there are no clouds nearby. What to do? Easy--you pummel the birds and steal their feathers. Also floating among the clouds are other horses--those annoying "Pritty Ponies." (You know their kind.) When you see one, you fly over and say "hi." And by that, I mean you hop onto its back and push it into the meat grinders waiting below, producing a glorious gusher of blood, bones, and horseshoes. Of course, you have to jump away at the right time, otherwise you'll meet the same fate. That's all there is to it--just good, wicked, pony-pulverizing fun! Wild Horses Couldn’t Drag Me Away: In Unpleasant Horse, you rack up points by inflicting damage on Pritty Ponies and birds. Points are scored based on the number of clouds you land on, birds you dive bomb and Pritty Ponies you grind to bits. You also get points for "style," based on how elegantly you wreak havoc and avoid the meat grinders. This game definitely requires a warped sense of humor, and it's disturbingly amusing and addicting. Unpleasant Horse is a universal app, so it's also optimized for the iPad. Unfortunately, there's no Game Center integration. It would be nice to compete with the other twisted souls who like this game so I hope this will be added to a future version.